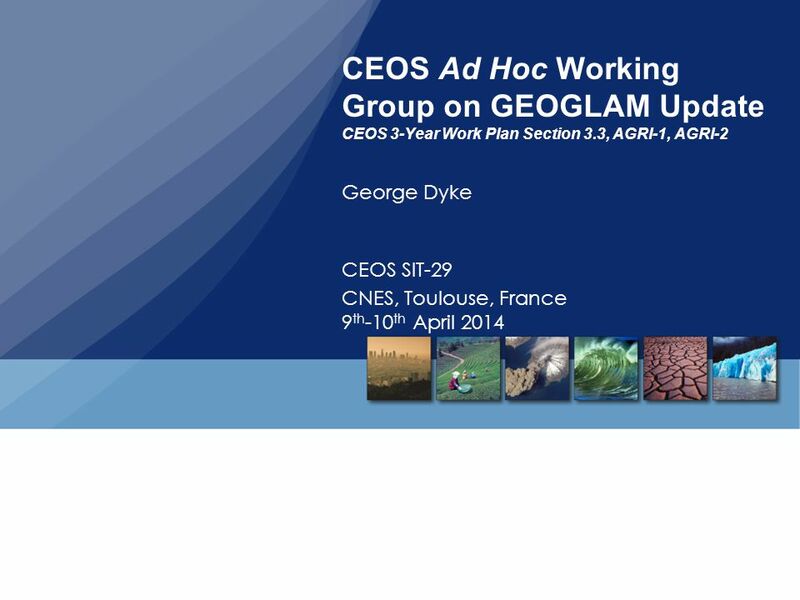 CEOS Ad Hoc Working Group on GEOGLAM Update CEOS 3-Year Work Plan Section 3.3, AGRI-1, AGRI-2 George Dyke CEOS SIT-29 CNES, Toulouse, France 9 th -10 th. 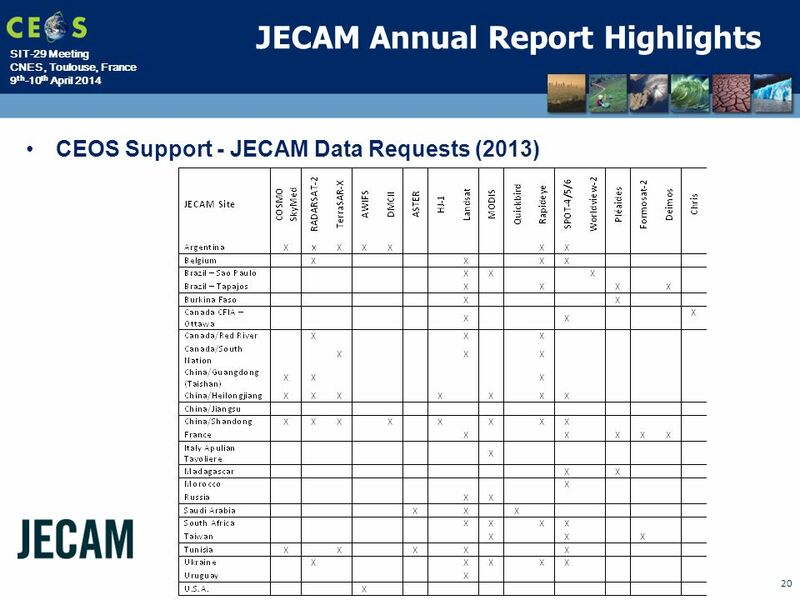 18 SIT-29 Meeting CNES, Toulouse, France 9 th -10 th April 2014 18 Data Services Prototypes for GEOGLAM o The SEO is working directly with JECAM (Ian Jarvis and Peirre Defourny) to develop a data services prototype for several JECAM Test Sites. 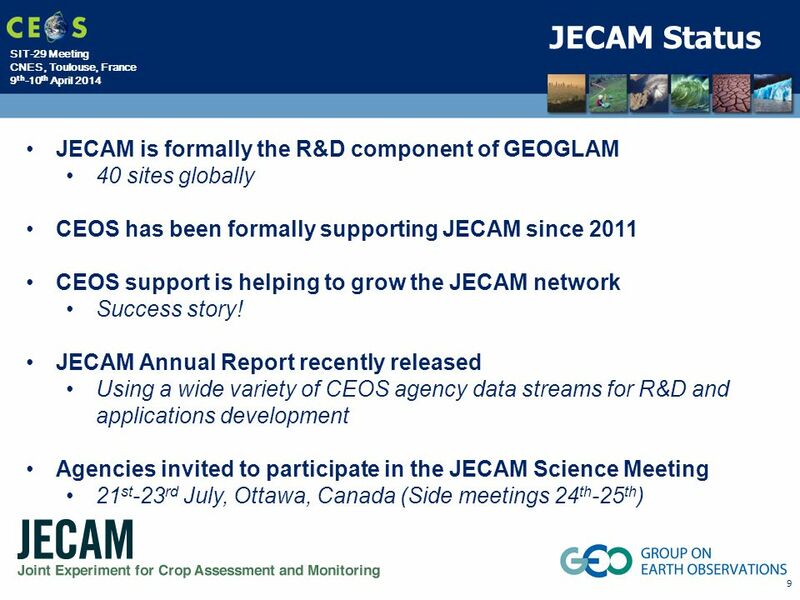 The features of this prototype will include... o Password protected (secure) access for JECAM science users with the ability to share data and tools across test sites within the guidelines of any license agreements. 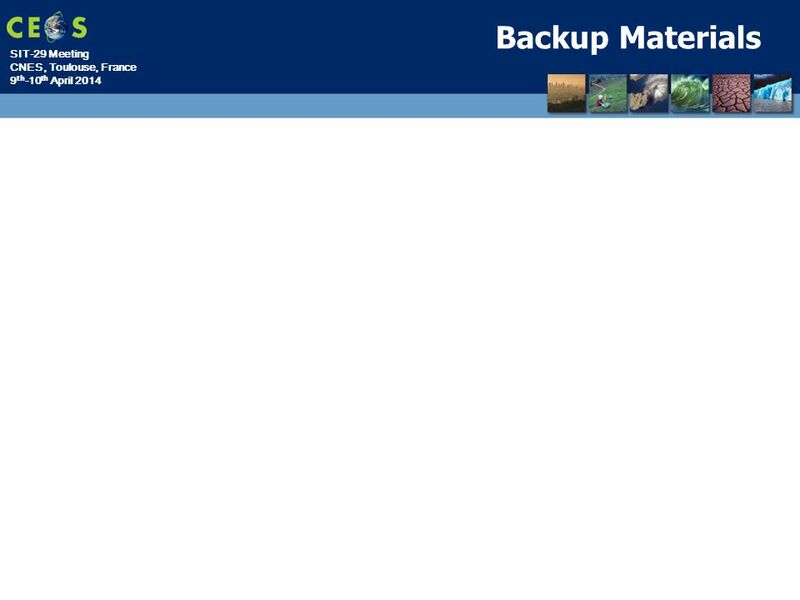 o Dedicated storage for current datasets, including those purchased commercially. o Download / Upload and Cloud Computing capabilities for analysis o Data archive search and discovery using COVE. 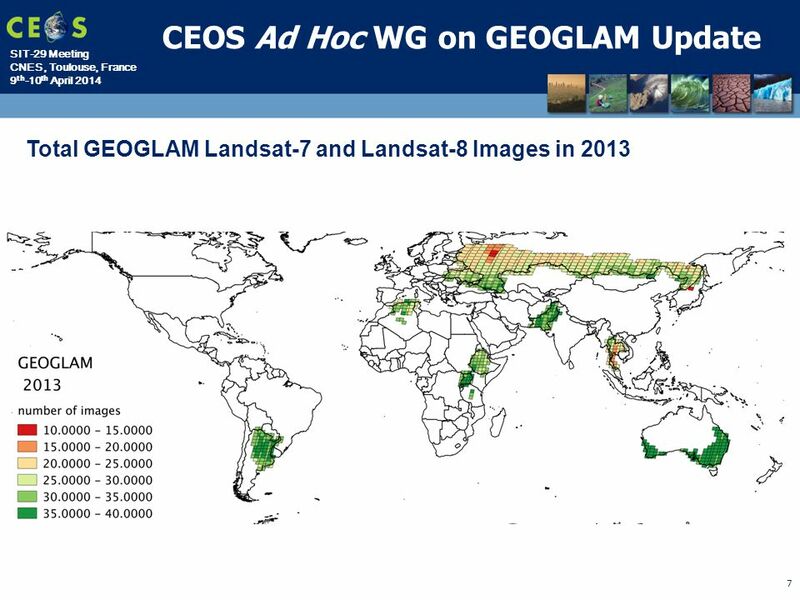 Links to archives from Landsat, Radarsat (coming soon), RapidEye (coming soon), TerraSAR-X, TanDEM-X, SPOT, Pleaides. 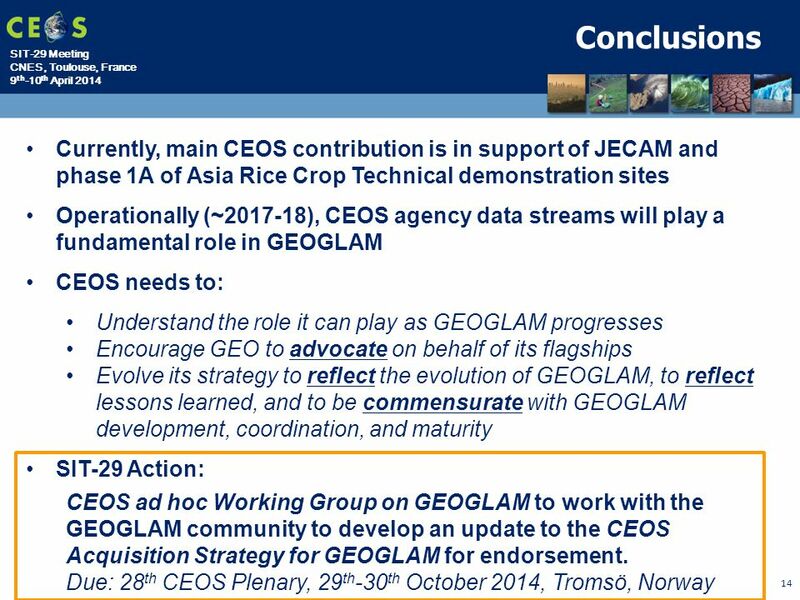 o The SEO is working directly with the Asia-RiCE team (Shin-ichi Sobue, RESTEC and Yves Crevier, CSA) to develop a data services prototype for Indonesia. 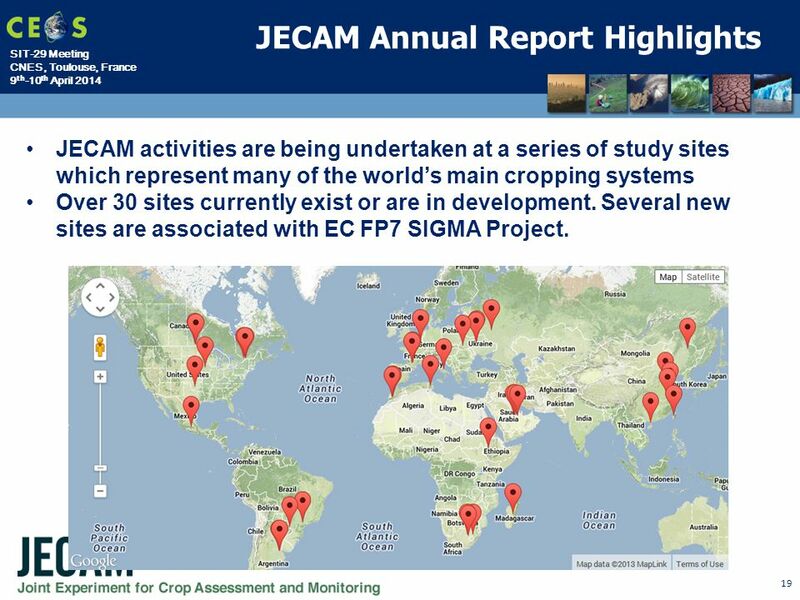 The features of this prototype will include... o Password protected (secure) access for Indonesia Asia-RiCE science users. 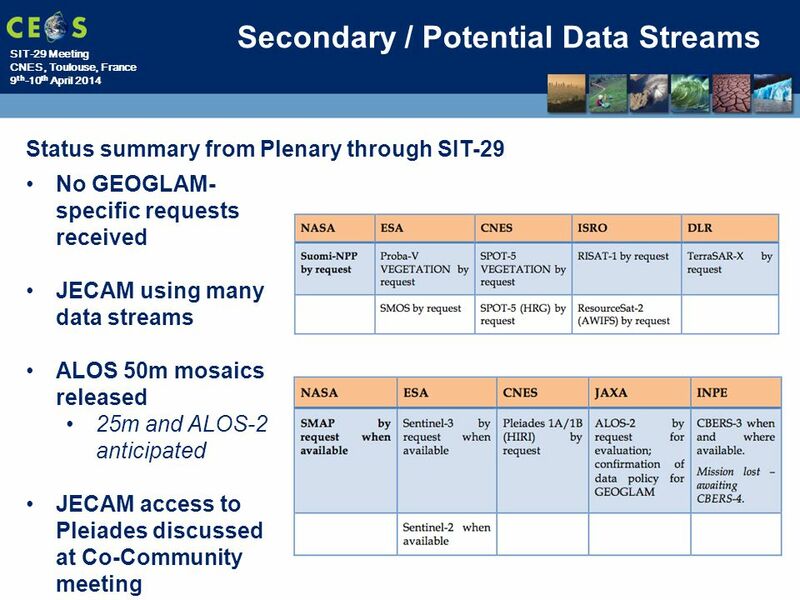 o Dedicated storage for 35 Radarsat-2 images, provided by CSA. 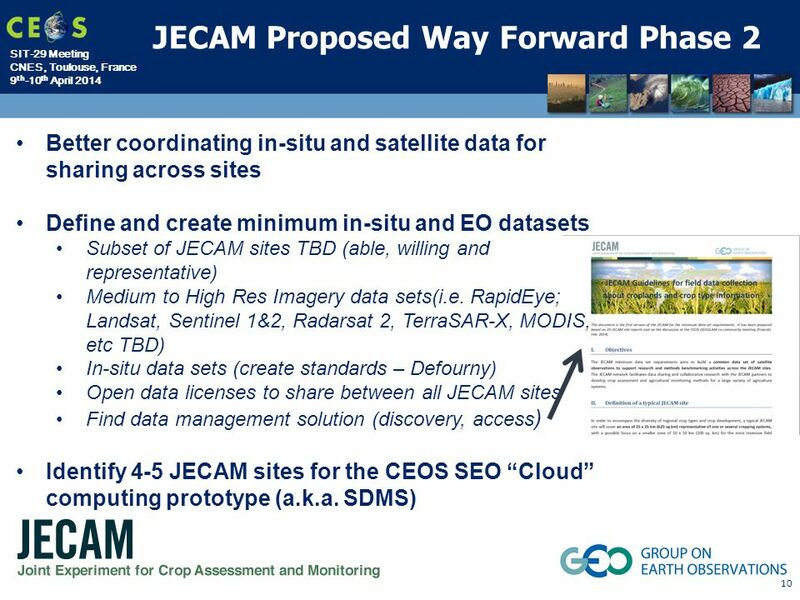 o Cloud computing processing capability to allow JAXA to run SAR processing tools on remote servers for enhanced performance. 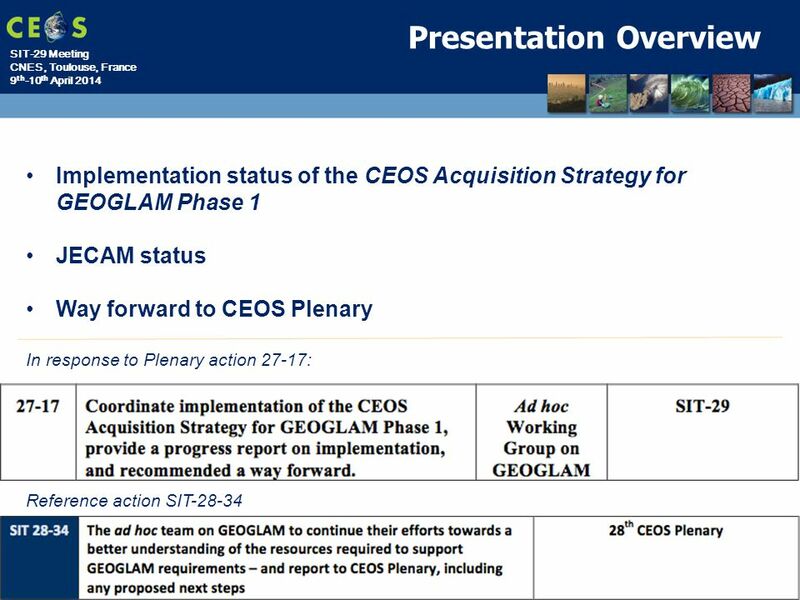 Download ppt "CEOS Ad Hoc Working Group on GEOGLAM Update CEOS 3-Year Work Plan Section 3.3, AGRI-1, AGRI-2 George Dyke CEOS SIT-29 CNES, Toulouse, France 9 th -10 th." 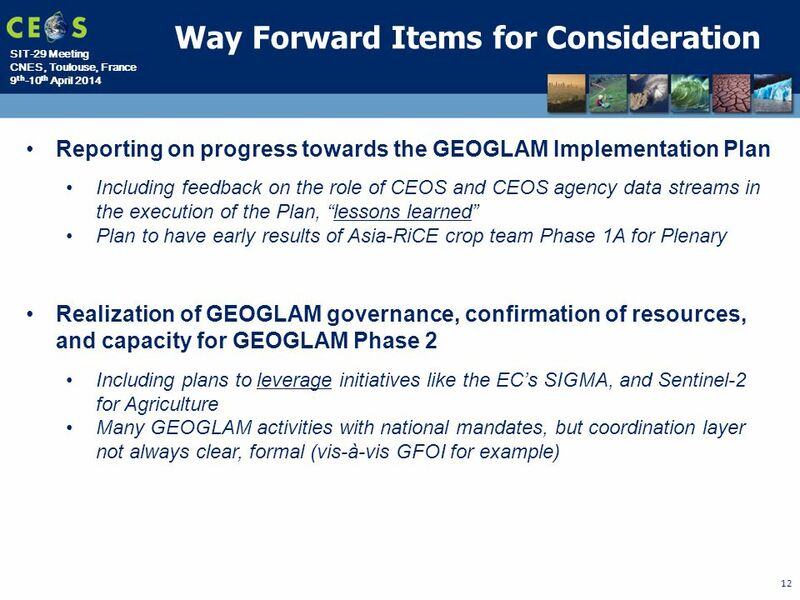 Agencies’ response to DRM pilot EO data requirements Ivan Petiteville (ESA, Chair WGDisasters) Stéphane Chalifoux (CSA, Vice-Chair WGDisasters) Andrew. 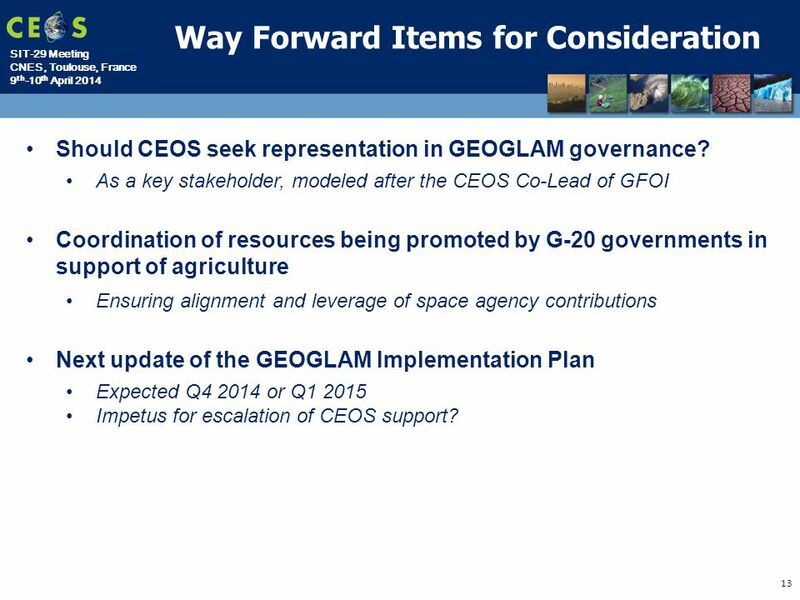 Report on GEOGLAM Selma Cherchali – CNES Bradley Doorn - NASA SIT-30 Agenda Item th CEOS SIT Meeting CNES Headquarters, Paris, France 31 st March. 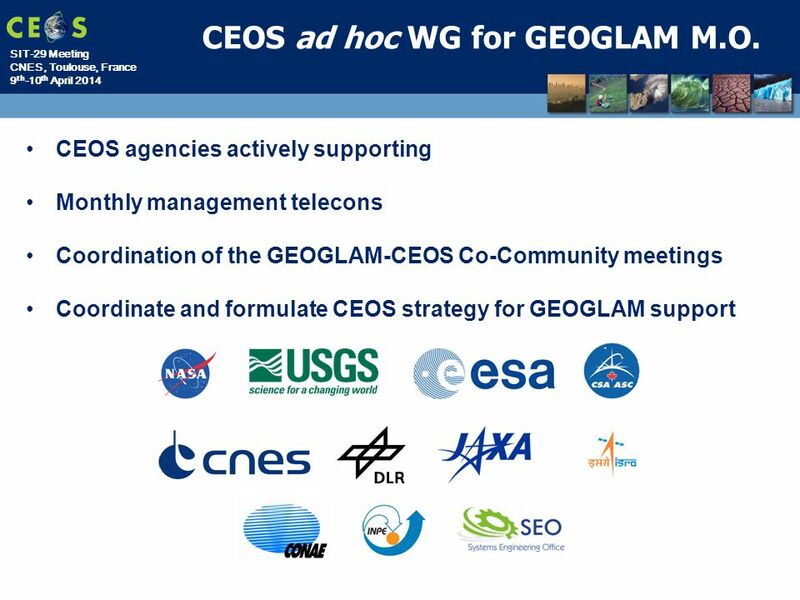 CEOS Systems Engineering Office (SEO) Data Services for GFOI Brian Killough NASA LaRC, CEOS SEO Presented at SDCG-6 Oslo, Norway October 22-24, 2014. 25th CEOS Plenary | Lucca, Italy| 8-9 November 2011 Consideration of CEOS Response to the Arctic Ecosystems Initiative Agenda Item 14 Guy Séguin Canadian. 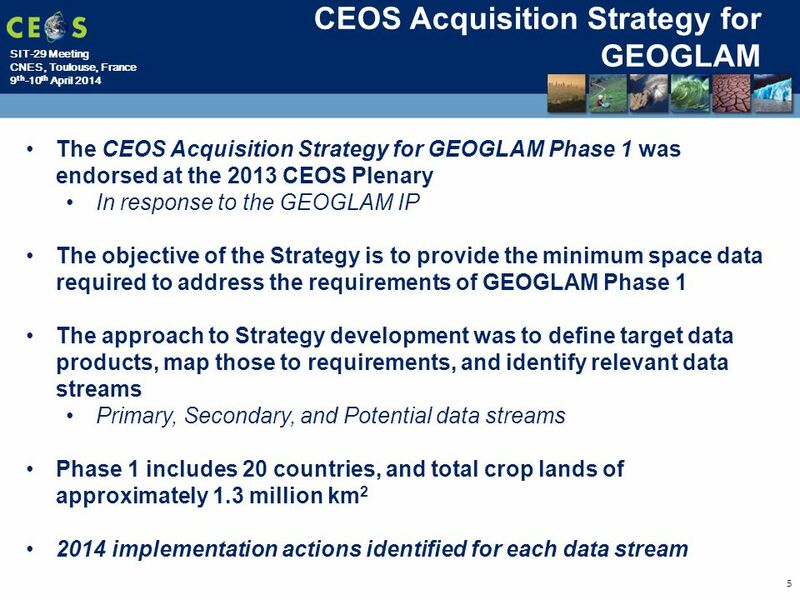 CEOS Plenary Meeting Lucca, Italy November 8-9, 2011 CEOS Systems Engineering Office (SEO) Annual Report Brian Killough NASA Agenda Item #18. 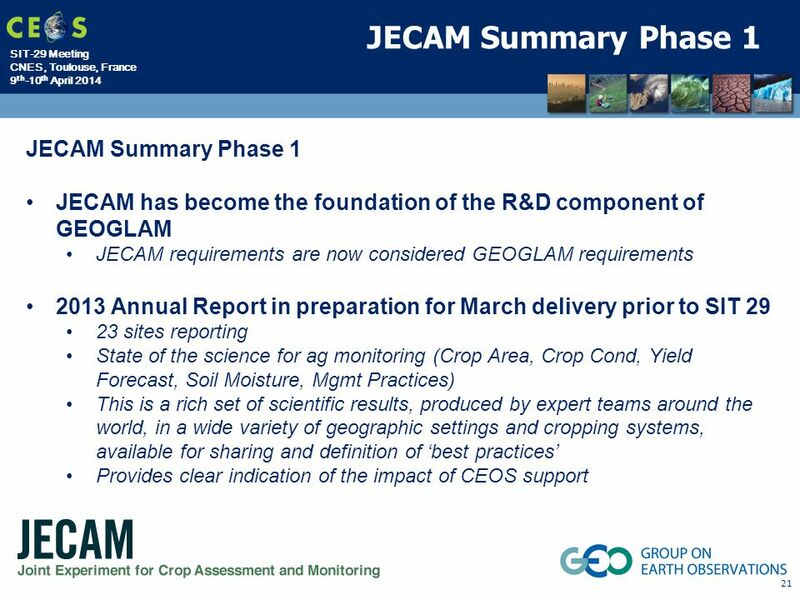 GEOGLAM Update Michel Deshayes, GEO Inbal Becker-Reshef, Alyssa Whitcraft, UMD GEOGLAM Working Group CEOS SIT-29 Side Meeting CNES, Toulouse, France 9th-10th. 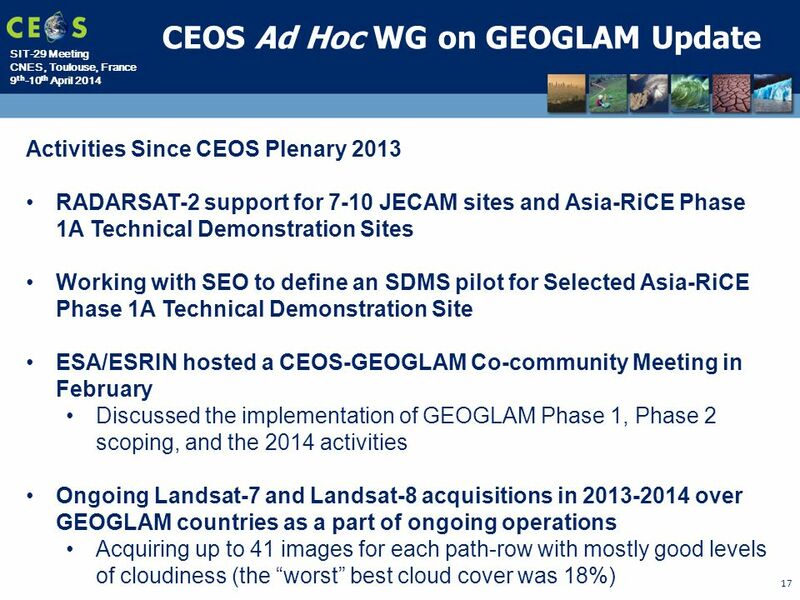 GEOGLAM Phase-1 Analysis by the CEOS SEO Brian Killough CEOS SDCG-3 Meeting February 7-9, 2013 Sydney, Australia. 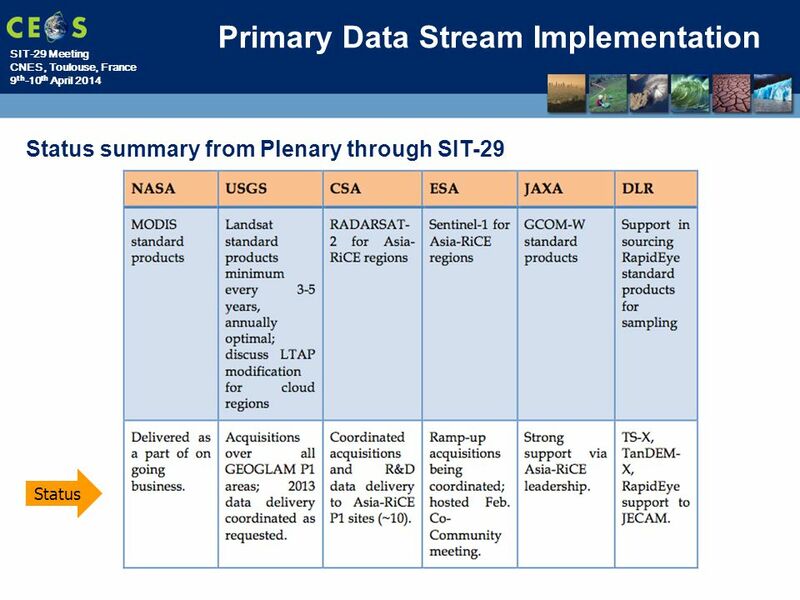 Update on Global Forest Observations Initiative (GFOI) and the Space Data Coordination Group (SDCG) Stephen Briggs & Stephen Ward (Ake Rosenqvist, Frank. 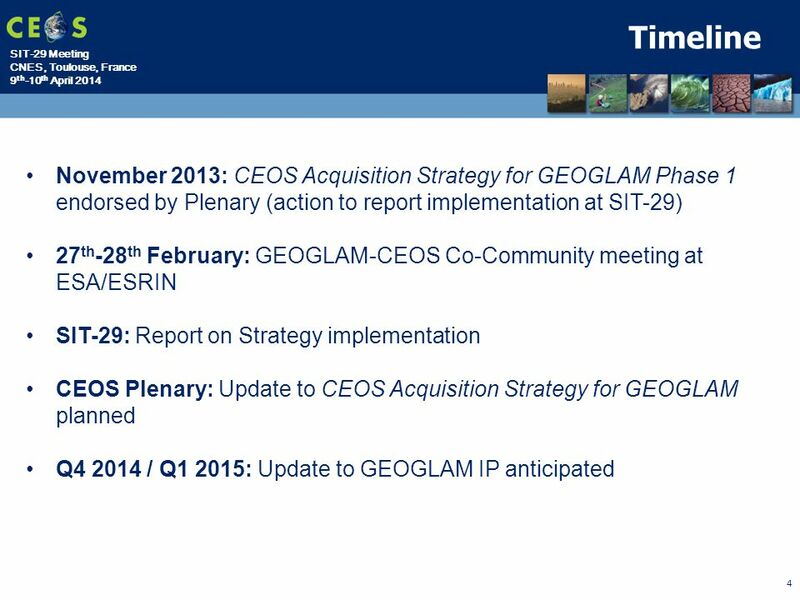 Slide: 1 27th CEOS Plenary |Montréal | November 2013 Agenda Item: 30 Stephen Briggs, Stephen Ward Ake Rosenqvist, Eugene Fosnight, Frank Martin Seifert. The 26th CEOS Plenary – Bengaluru, India October, 2012 Presentation to the 26 th CEOS Plenary at Bengaluru, India October, 2012 Ad-hoc Space. 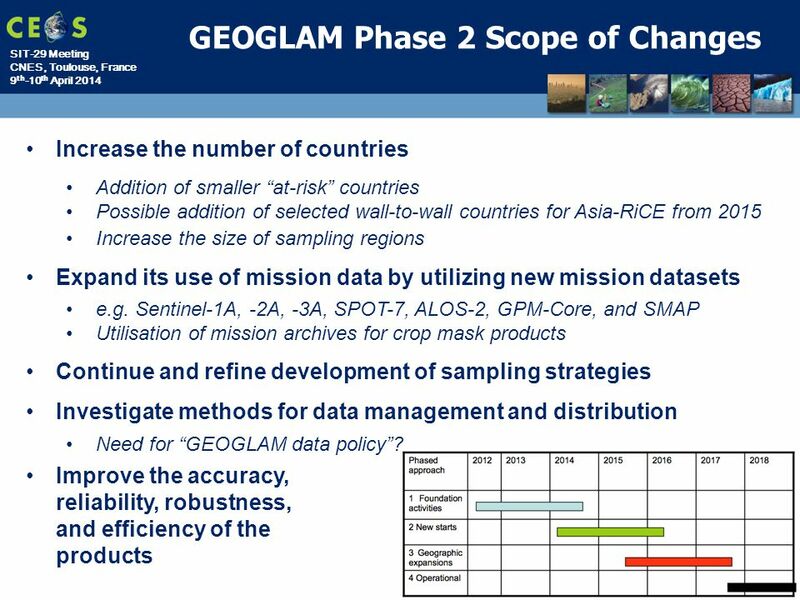 GFOI Baseline Global Data Strategy Document: Discussion S. Ward, G. Dyke Space Data Coordination Group meeting #2 Reston, VA, USA September 2012. WMO GFOI Simon Eggleston SGCD-4, 4 th -6 th Sept 2013, Caltech, Pasadena, USA. SEO Report to WGISS Brian Killough CEOS Systems Engineering Office (SEO) WGISS-39 May 11-15, 2015. 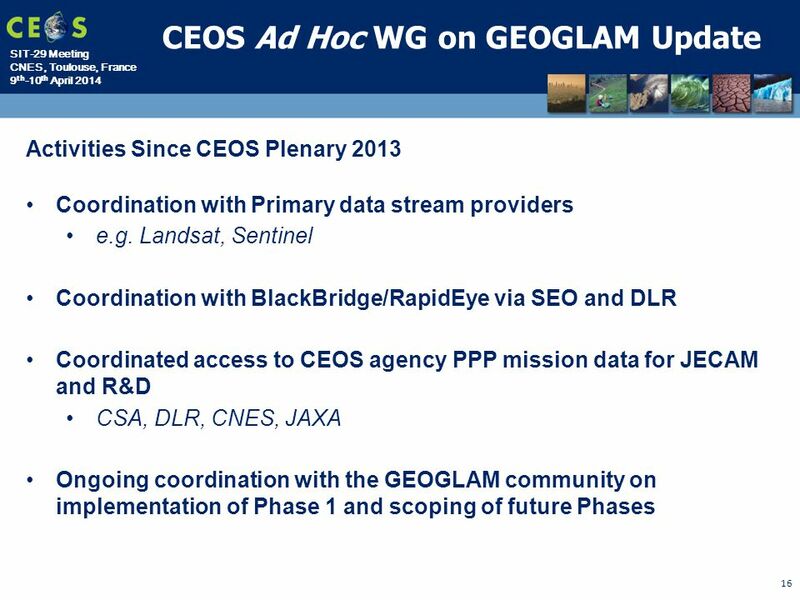 Space Data Coordination Component Eugene Fosnight on behalf of SDCG Exec Sydney, 2 nd March 2015.